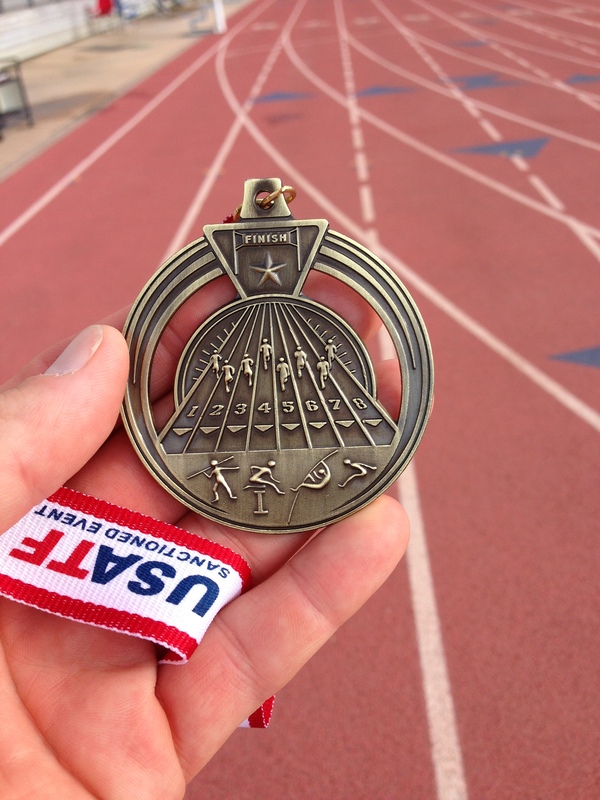 Last weekend I competed in the USATF Masters Decathlon Championship. I scored “okay” and was able to take the M40 title, but I failed to reach the score I was gunning for. My goal going into the competition was to break into the top 10 all-time m40 decathletes (World, not US). Kip Janvrin, one of the best decathletes of all time, owns the M40 World Record by a country mile, so there was no chance of getting close to that. Compared to the extremely thinly competed Indoor Heptathlon in which I set the American Record back in Feb, Outdoor Decathlons are common, so the number of high quality athletes who have competed in them is high. Anyway, my quest for Top 10 failed miserably. I was barely able to break into the top 25…and in retrospect, it’s pretty obvious why. I have lots of excuses I can pull from: Weather (90 degrees with 90% humidity), jet lag, sleeping in hotels, road trip food, headwind, 45min delays right before the 100m and 110H…but those are all standard things an athlete and coach must deal with. And, honestly, I think I planned and dealt with all those things pretty well. The real reason I scored below my expectations was a poor training plan (I’m not willing to say my expectations were too high, yet). And I should have expected it really, but I was lulled into thinking I was “okay” because of my practice results. For me, these are all improvements since February, so I was lulled into thinking I was more ready for the Decathlon than I really was. The rude awakening came right out of the blocks. My legs weren’t heavy, but they weren’t responsive. The “pep in my step” wasn’t there. This resulted in a horrible first 40m in the 100m/110H and a lack of explosion in the LJ/SP/HJ. Another old crazy guy here…had a good run at the multis when I was 50/51, trying to decide now if I make a run at the 55s next year. Also suffered a sports hernia last fall; tried everything for 3 months but just couldn’t make it go away. Both the inner and outer ab wall were torn. Fortunately we have one of the best docs in the US for this injury here in Northern California, William Brown. Would highly recommend him if you have ongoing issues with this. Good luck with your training! Thanks Tony. I’ll definitely consider William Brown if it comes back/flares up. Did you go through therapy? Love to know when he put you through (in general). Hope to see you in future multi’s. I know there is one up your way in Sept (Marin area).